Romeo Dallaire may be best known for his book titled Shaking Hands with the Devil. Since retiring from his illustrious military career, he has taken on a new task – to end the use of child soldiers in war. He is the first to admit that this is no small task, and Dallaire has gone on record to say “I have been leading this fight for over five years, without a force behind me. I’ve come to realize that this is not something anyone can accomplish alone.” And with that realization, Dallaire has turned to social media for help. Zero Force is a global effort to recruit an army of motivated individuals to work towards the eradication of the use of child soldiers. While the target audience is primarily under the age of 25, Dallaire makes no distinction and turns no one away from the grassroots advocacy army. Since 2001, the participation of child soldiers has been reported in 21 on-going or recent armed conflicts, in almos t every region of the world. 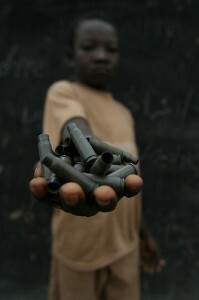 The United Nations has estimated that there are approximately 250, 000 child soldiers worldwide. Children may be abducted, forcibly recruited or coerced by being given very limited alternatives, essentially forcing them to volunteer for service. Poverty, separation from family, displacement and living in areas exposed to armed conflict, make children even more vulnerable to recruitment/abduction. Many of who were abducted from their homes and their families and forced to commit atrocious acts of violence as a means to desensitize them from the realities of war. Taking to Facebook and Twitter, Romeo Dallaire hopes to mobilize 2.5 million young activists to eradicate the use of child soldiers. Recognizing the strength of social media, Dallaire wants to do more than just spread a twitter message; he wants to tap into the power of young activists with a will to create change. Dallaire believes that a group of motivated and connected young people can and will change the world, and for Dallaire, that needs to start with changing the world for the youth who are forced into war. This is an amazing and inspiring goal. We will be passing the word on to our followers and fans. Our volunteers are already enlisting as we speak!